Join us live each week at www.productivity.academy/live and get your questions answered by submitting them at anytime right here: www.productivity.academy/questions. You can watch the video for the past episode recorded on May 31st, 2018 above, or you can review the transcript below. What are some great tips for a young entrepreneur to improve productivity and time management? What is one piece of simple advice that actually changed your life? How are you increasing the value of your time as an entrepreneurial business person? Hey, everyone. Welcome to Productivity Academy weekly Q&A number 38, so we are rolling right along. It is the very end of May. Tomorrow is June. Before we get started I just want to say, if you’re watching on YouTube, be sure to hit Subscribe if you want to stay up to date and get notifications for updates like these, or new videos on the channel. Then as well, if you’re watching this inside of the Facebook group, thanks for watching, thanks for being here, and leave me a comment or a question. I’ll also be looking over here off screen occasionally to see if any questions come in live. If you’re not in the Facebook group yet, you could join. It’s a free group. If you’re interested in productivity, organization, time management, improving your processes, things like that, then that’s a great place for you. You can grab the link, I’m sure, below and join us there. All right, so today we’ve got some good questions. I’ve got a little bit of a personal question/example I want to use, some ideas about tips for young entrepreneurs to improve productivity and time management. A good one, not so much productivity but, “What is one piece of simple advice that actually changed your life?” Then, “How are you increasing the value of your time, or my time, as an entrepreneurial business person?” So, got some good questions too, and eventually I’m going to actually put these back here to use. But as you can tell, I’ve changed locations, moving, and then really looking forward to getting these to use for videos. I’m obviously using them. If you’ve seen my past videos I guess over here, I did some expectation value actions where we go through and say, “Okay, what are the projects or big tasks I’m looking at or working on?” And then assigning values to those. I only really look at three things, how excited I am personally. Whether it’s excited for the outcome, or excited to work on it, or whatever it is. Assigning just some value to that between one and five. And then, doing the same for short term ROI. Literally what is the ROI? Again, it could be if it’s riding my bike every day or something, that’s not necessarily a return monetarily on investment. Bu, assigning it just a value in terms of if it’s exercise, maybe it’s what I’m most excited to spend my time doing. Or, if it’s business related, what’s the short term actual monetary ROI. And then, long term. This varies for you, for me, however we want to define it. But, just looking at those three areas. How excited a day am I, what’s the short term return on investment, and what’s the really long term return on investment? And then you kind of exponentially increase those values, and divide to get a number, all right? The whole reason you do this is not because it’s fun, which it kind of is. But, it’s to get all that stuff out of your head, and to give it a concrete value. It forces you to do a little deciding. “Hey, is …” I’ll go back to the example of my riding my bike. Is riding my bike every day more exciting to me, or is it going for a swim? Which one’s going to have the biggest payoff, and where should I focus my time? And helping you decide that. Instead of holding this stuff in your head because we have that tendency to just accumulate these ideas. They’re not bad ideas, but we truly can only focus so much. Whether it’s spending our time exercising, whether it’s business projects, meeting people, whatever it is. So, I’ve found this to be really helpful once a month, once every quarter at the least to go through and do this exercise. So, I will post a link to that. I know I made a video about it with the worksheet. So, if you’re interested in that I highly recommend it. It’s a great exercise personally, and then I think too for businesses as well. Back to the questions. Before we get into those though, I had something happen this weekend that I thought was really interesting. I enjoy getting out, I love being around people. But, I’m definitely not an extroverted extrovert. We had friends come into town, and it was tough in the sense that they were here for several days, it was over a long weekend. They came for an extra day. We had already made some plans, had a lot going on and I was starting to feel that stress, right? Where you’re like, “Ah, I already had things on my book I needed to do. I’ve got my calendar.” And, the opportunity was there to just blow it all off. Or, to become overwhelmed by trying to do too much. I think it’s really important if you have time to plan, to go ahead and plan those out. I looked back and we didn’t do a great job of saying, “Hey, okay we’ve got a few days before they show up. We know that …” For example, we weren’t planning on having people here for four days, we ere thinking two. “What can we do to alleviate this, and be up front about it?” A little bit of planning and communication right there really goes a long way. We went into the weekend, and I will say the one thing that really helped again, and I just of course love talking about this, is the daily planning. Whether you see down with your journal and do some full out thing, or you’ve got your calendars. But, just sitting down and spending as much time as you can. Some days maybe when you’re busy and you have family in town, or you have friends visiting, that’s two minutes. Just saying, “Okay, you know what? I looked at my task list. I know I’m not going to get hardly any of this done, but there’s one thing that I have to get done today. I’ve got to make this phone call, I’ve got to carry out this task, I’ve got to email that person. And then the rest of the day we’re going to be doing these things. No, that’s right, they really want to do this one thing, so write that down.” And just going through those motions will help you so much, instead of just blowing it off. I’m still guilty of that from time to time, especially when we were moving. And forgetting, or just being lazy and saying, “Ah, I don’t need to do that from time to time.” And then that really catches up with you, whether you miss important things that you had told yourself you wouldn’t forget. But again, falling back on that system, so that, that system can support you instead of just relying on your brain. Anyways, interesting weekend in terms of planning, and seeing the systems at work. Feeling overwhelmed at times but realizing, “Oh okay, you know what? Things are actually fine, going well.” So I ended up having a good weekend in terms of getting to see friends, and also realizing, “Hey, I do need to spend some time working,” being up front about that, and continuing the little daily planning cycle. So, a little insight into the craziness. It’s not all organized down to the minute or anything like that, you know? Like everyone else we’ve got to make changes and adapt to the situation. If your systems and processes don’t work for you that way, then you need to make them work that way, all right? Or, if you want to live a more rigid lifestyle and make other things flexible, then you can make it work that way too. All right, so what are some great tips for a young entrepreneur to improve productivity and time management? I think that’s a really good question for many reasons. I can only, for me I can look back at when I was younger, and then some of the younger people I’ve talked to as well. Getting in, and being involved as an entrepreneur. I’m going to take this kind of from the standpoint of you’re more in control of your time pretty much, unless if you’re doing it on the side. However you want to view it. But, I think a lot of younger people I’ve met, and myself too. This is heavily for myself when I was younger, you’re not so … I guess, I wasn’t seeing the power of routines and processes at that time. 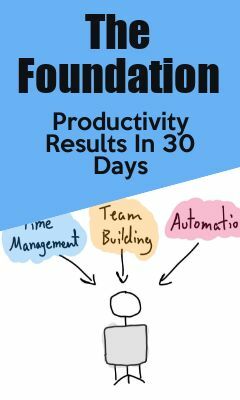 I understood it, but I figured I a lot of times didn’t need them, and I didn’t see the underlying power of having routines, processes that you can build up over time. You pay for that, whether it’s blood, sweat, and tears. Or, wasted time. A lot of that is going to help you. I think just doing some basic learning, whether it’s reading books like Work the System, or getting a calendar if you don’t use a calendar. Using time management, time blocking, coming up with a system though and being regular about it, and having a routine. Again, you can … Like I was saying earlier, you can make this flexible and make it work for you. But, establishing those early, and having that routine. I always talked about a daily routine, I think that’s a great one to have in the morning, is to sit down, go through your day, and then do a wrap up in the evening. But, establishing that early, and finding what works for you. Again, maybe it’s 15 minutes, maybe it’s 30. But, that’ll help you as you grow, whether it’s a career, it’s a business, it’s several businesses that’ll pay off over time. Because, creating these own processes for yourself will help you implement those in the business, and help you grow. Let’s see, I think as far young entrepreneur to improve productivity and time management. Yeah, I think that’s the number one is take the time to start giving yourself routines and processes. This doesn’t mean living your life planned down to the minute. But, being regular. Taking regular action. I guess the other thing I would say is, take some time to learn. No one’s born with this stuff. Get out there. If it’s an hour a week, 30 minutes a week. If you can master or become over time, your own master of time management and your productivity then you can do whatever you want. So, I would say investment some time back into yourself. It could be something so simple as once a week sitting down and saying, “What worked well for me? What didn’t?” Literally write it down. “Okay, well if it’s not working. Well, can I either fix it, can I trash it, delete it, or can I delegate it?” And then, “What’s working well? How can I double down? How can I get more results like that?” Then beyond that saying, “Okay, can I look outside of my immediate area? Can I learn from someone? Can I read a book, can I take a course, can I get a mentor? Things like that. I think that’ll help. Good question. What is one piece of simple advice that actually changed my life? That is a tough question, and is definitely one where I wish I would have thought about it some more ahead of time ’cause there’s so many good ones. But, I’m just going to go with my gut on this one, and that is something that what my father told me. That was … The very short version of this is, “You regret the things that you left undone or you didn’t do.” Okay? Meaning, if you do something, and not in a bad way, right? If you’ve done something … I mean, in this case do what works. If you do something bad, or against someone, okay that’s … Don’t do that. But you know, you can work to apologize, you can work on that. But, the idea is let’s say you try to do something, or you did something and it didn’t turn out correctly, or went poorly. You can fix that. You can learn from that, and you can try. But, the things that you never do, you never attempt, you never get a second chance, right? You never did it, and you’ll never know, okay? There’s so many things where this takes place. Whether it’s business, you didn’t … You try, you let people talk you down from something. Or personal, you didn’t reach out and tell someone, “Hey, you know what? You did a really good job on this project.” Your partner, your spouse, “I love you. You did this, that.” Those types of situations, where we end up wishing that we would have said something, and you never realize sometimes how much of an impact you can have on that persons life. Whether again it’s spouse, team member, an employee, something like that. This can really help. So, pretty simple advice but I think it goes a long way, and it’s a good one to remember on the day to day. All right, so let’s see. Last question for today. How are you increasing the value of your time as an entrepreneurial business person? There’s a definite answer to this. Increasing the value of my time has been done by creating a team. I’d like to say that its been done in a very systematic way, but it hasn’t. It’s becoming more systematic over time, which is what a lot of this is about, is learning what works for yourself, building the processes, building these systems. Now as I’m building out a larger team and saying, “Okay, I’ve got my assistant whose also a project manager.” And then finding the roles underneath that as we need them, okay? Right now that’s filled by a couple VA’s, and then we do some contract work as needed if we’re making content, or we need some work done on a website, or a sales funnel, whatever it is. But, that’s increasing my time because that allows me … As I build the team and the processes, those things really do go together. ‘Cause I can’t just throw stuff at them and hope for the best. If I do, I can tell you how it’s going to turn out and it’s not good. But, I work with them to build the processes, or something I’ve done, I show them how to do it, we write it down, we record it, we refine it. And then as time goes on, we get better, and better, and better at that. And I get to spend my time doing higher level work, whether that’s finding customers, whether that’s actually dealing with the business. How can I grow business, how can I work on the marketing? Things like that. Where, meeting with people. These are … Using things that I’m highly skilled at, that someone else literally could not take my place. And getting those things off my plate, where if someone can replace me, it’s like, “Ah, I like writing, I can make … I like writing up emails, and doing some content.” But someone else can do that, and they can probably do it better than I can. So, replacing myself where possible and where it makes sense, and kind of elevating myself up. But still being involved in the day to day. It’s an interesting one, and a balance that I enjoy working on is finding out where can you remove yourself, or where should you remove yourself from areas, where should you still be involved? So, ongoing question on that one, but that’s how I view it. I don’t see any more questions today, so I’ll just wrap it up real quick with saying those are some great questions. If you haven’t joined the Real World Productivity Growth Group on Facebook, just click on the link below. You can join, and just answer the few quick questions there, want to make sure you’re actually interested in organization, productivity, time management, all that good stuff. Come join, and attend these live. If you’re watching this on YouTube, by all means, subscribe to the channel. If you have questions, you can ask in the comments. Or, again, join the group and ask there. Thanks for checking it out, I’ll be back next week.